Brian Smith thrills huge SOD crowd with Butler finish line pass! Erie, Michigan (May 22, 2016) – Doug Zimmerman led 99.5% of the race, but Fremont, Ohio’s Brian Smith pulled off a dramatic finish line win in the Engine Pro Sprints on Dirt presented by ARP WWIII feature at Butler Speedway Saturday night. The feature got off to a rocky start when Quentin Blonde spun in turn three on the first lap and Brad Lamberson had no place to go and collided with Blonde. Both cars had to be towed off the track and race officials called a fuel-only red flag due to the twenty-lap clean up delay. A second attempt to start the feature didn’t fare much better, but cleanup was quick, and the restart had Doug Zimmerman charge into the lead from the pole position ahead of Bill Jacoby after original pole-starter Quentin Blonde was eliminated in the first lap crash. Zimmerman, rejoining former car owner Tom Dale this season after taking 2015 off, quickly developed a huge lead and masterfully worked through heavy traffic. 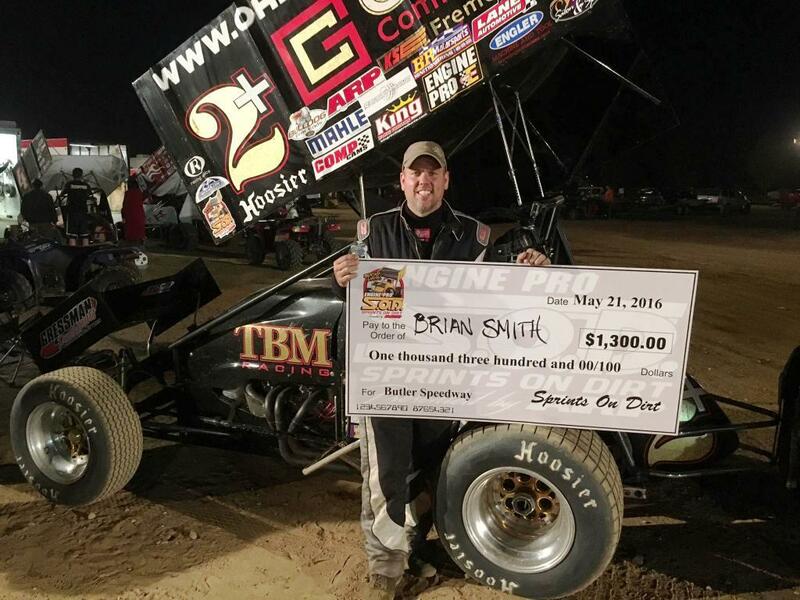 With everyone watching Zimmerman’s impressive drive, no one noticed Fremont, Ohio’s Brian Smith, top contender for 2016 SOD RockAuto.com Series Rookie of the Year quietly moving forward to second. A late race caution erased Zimmerman’s huge lead, and Smith, now in second, started pressuring the leader, but in spite of pulling alongside Zimmerman once when Zimmerman bobbled coming out of turn 2 late in the race, Smith couldn’t overtake the leader. With five laps to go the last caution flew, and on the restart, it looked like Zimmerman’s race long advantage coming off turn two would be enough to hold off Smith. About four car lengths behind Zimmerman going into turn three on the last lap, the large crowd was on its feet as Smith made a seemingly impossible charge high through the corner and out raced Zimmerman to the win by .068 of a second! The excited crowd was ecstatic when Smith did a “dirt angel” (you know, like a snow angel) on the front straight. The new Sprints On Dirt spec Hoosier Racing Tire rear tires have produced exciting racing in the first two races, Friday at Hartford and Saturday at Butler, and have received rave reviews from competitors. Not only did the tires perform flawlessly, but Butler winner Smith ran the same set of tires Friday on Hartford’s big track and for his Butler win.